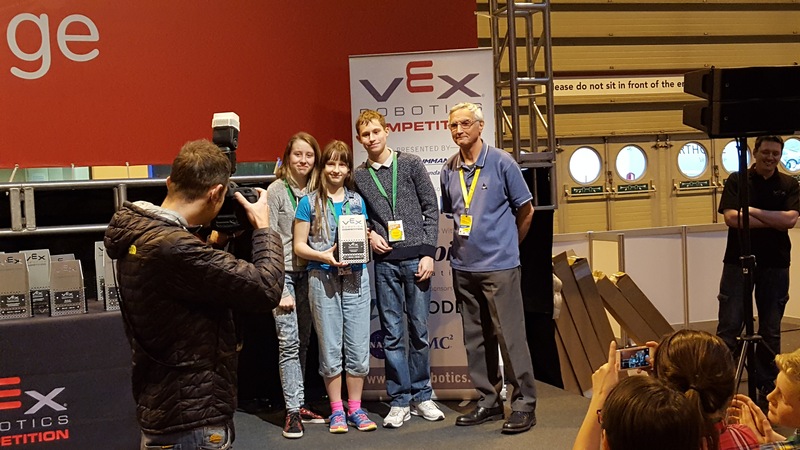 Team 3316B were involved in a stunning comeback at this year’s UK VEX National finals. 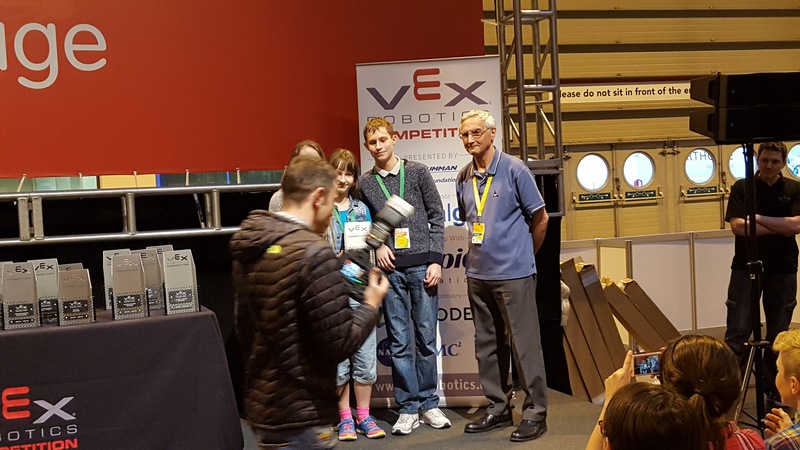 This year’s UK VEX National finals took place at the NEC in Birmingham from the 17th – 19th March. 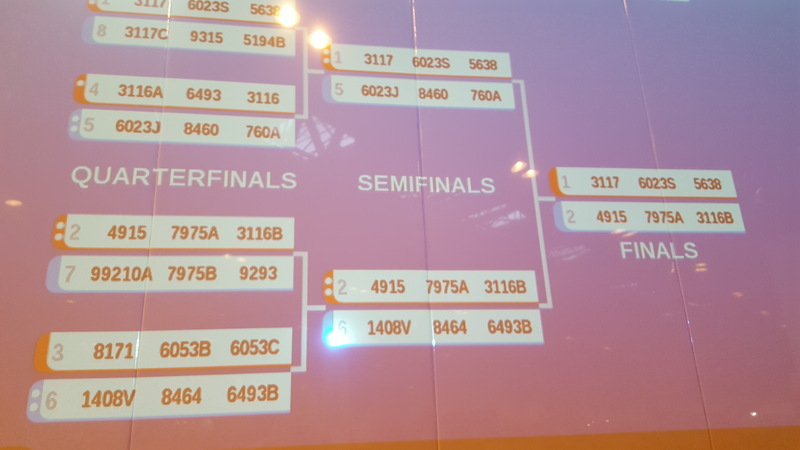 3116 had four teams representing them in the form of 3116, 3116A, 3116B and 3116Z. 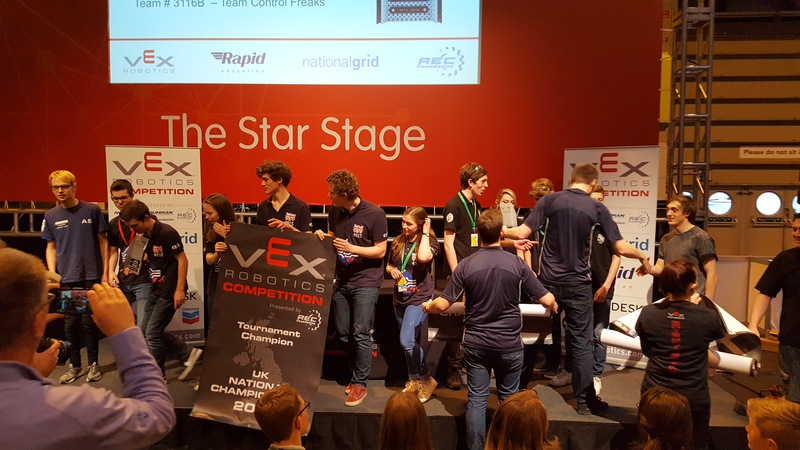 The teams consisted of students from year 7 all the way up to year 11 so we were really well represented with a strong foundation to build on in the future. 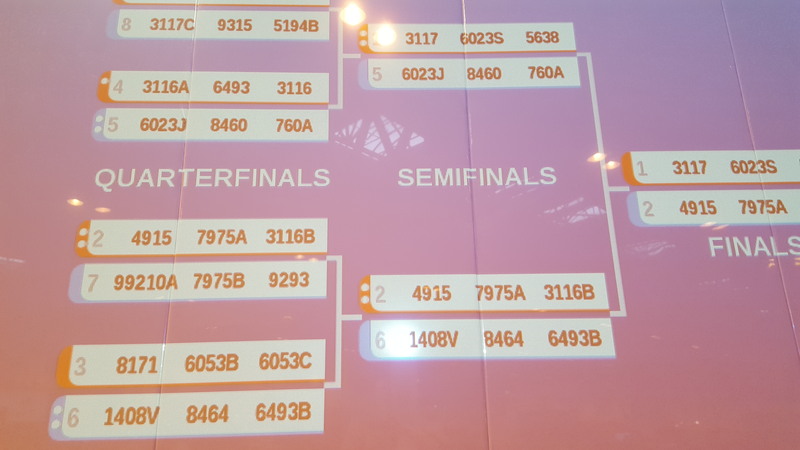 The first days qualifying was a mixed affair with all but 3116B winning their first round matches but with the teams struggling to find consistency in their performances. 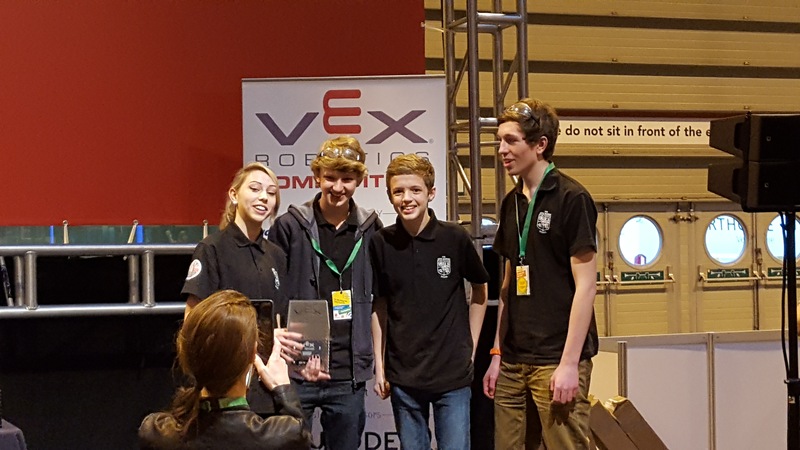 the best of the teams was 3116A, built and driven by the year 7 team of Kieran Higham, Morgan Banks, Harvey Edwards and Josh Evans. Winning all their morning matches pushed them to a top of the table battle with the Stirling Sharks from Stanborough school in Welwyn. 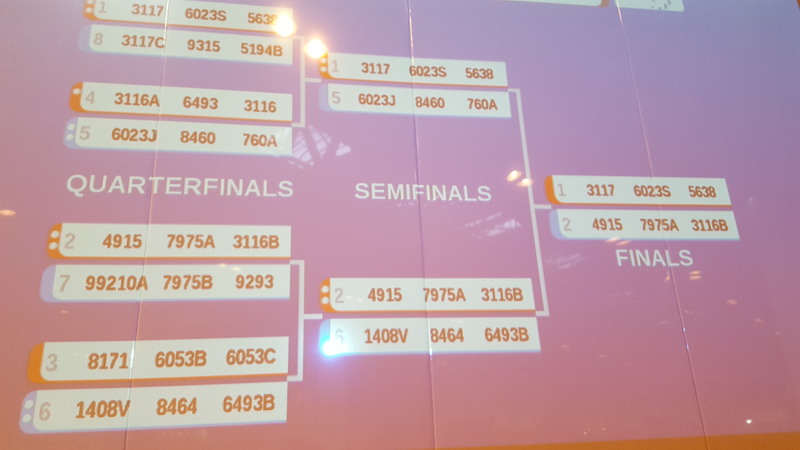 At the end of qualifying 3116A were still floating round the top of the table with 3116 and 3116Z sitting in mid table and 3116B unfortunately plumb last having experienced a raft of technical difficulties. Day two began with some more qualifiers and this time 3116C looked to have found their power and range, scoring accurately and consistently. 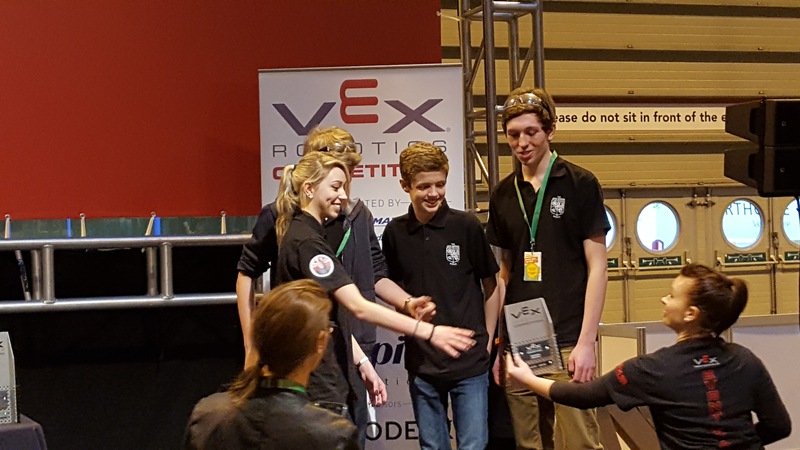 All the other teams also had a good morning qualifying and the final table showed 3116A in 5th, 3116 in 26th, 3116B having recovered to 29th and 3116Z sinking to 37th. The selection process proved to be one of the most surprising and entertaining to date. 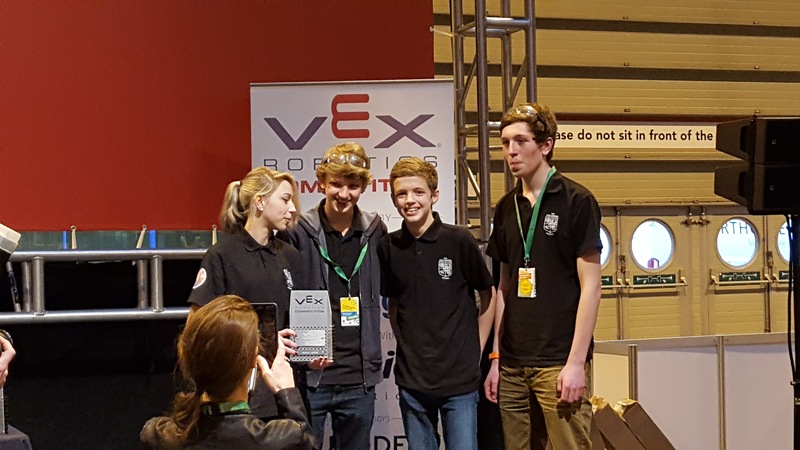 Top seed Sterling sharks selected 2nd seed Virus robotics but the later declined leaving the Sharks to look elsewhere at Stowebots for an alliance. In a semi shock move, Virus then selected The Smooth Ops from 10th place, proving that league position is not everything. 3116A selected Venom as their partner to make up the 4th ranked alliance. The third picks proved even more of a shock as The sharks picked the 22nd placed TDMS team and Virus opted for the newly invigorated 3116B who had been in 29th place! 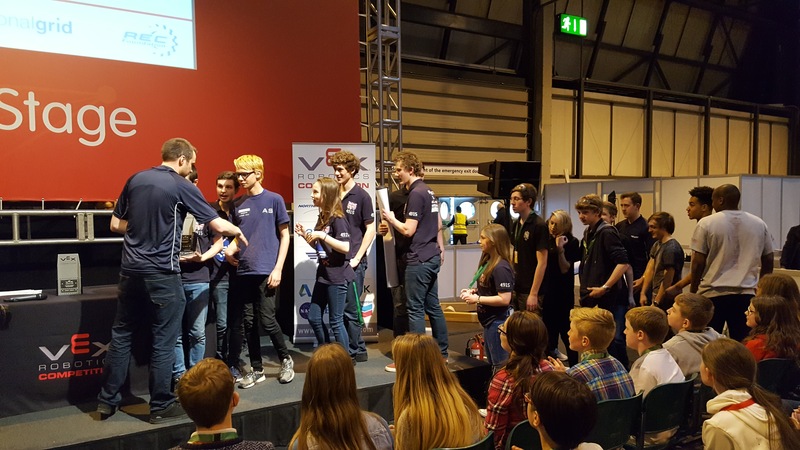 3116A selected their fellow school team in 3116 hoping that their lifting capability could make the difference in the knock out stages. 3116Z unfortunately failed to gain an alliance selection. The alliance of 3116A, Venom and 3116 had a tough quarter final match and were unfortunate to lose the first round after Venom broke down. They made a good come back in the second leg, levelling the tie at 1-1. 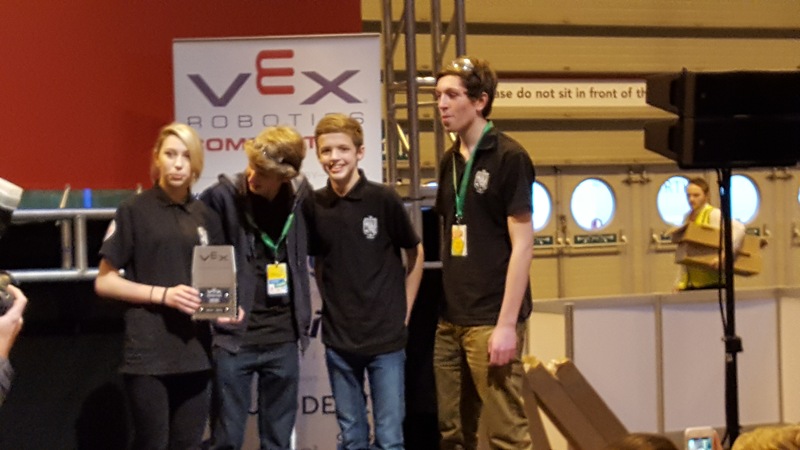 The third leg proved too much and even with a last ditch lift gaining an additional 50 point bonus, the tie went to the opposition and the second and third JWS teams were heading out. 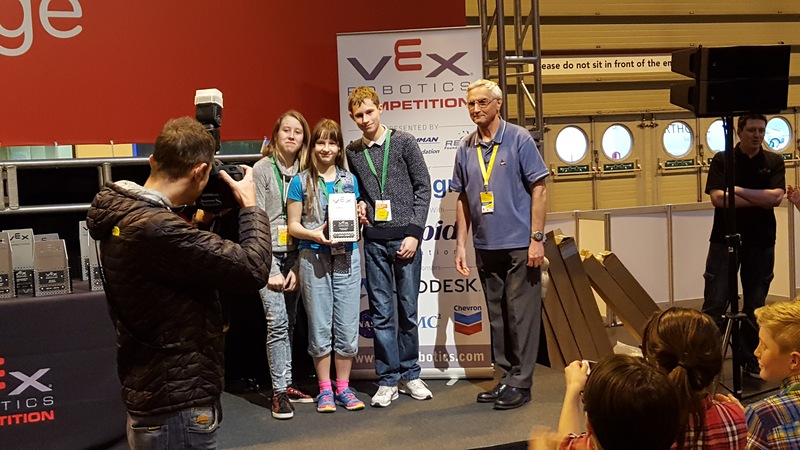 On a positive note, 3116 lifting ability had caught the eye of the judges and their consistency, reliability and overall excellent design had earned them the team of Claire Gill, Kaitlyn Mockett and Lewis Brooker the Innovation award. In the other matches, Virus and their alliance cruised through to the final whereas the Stirling sharks had a tough semi final match which the narrowly scraped through to meet Virus, Smooth Ops and the Control Freaks in the final. 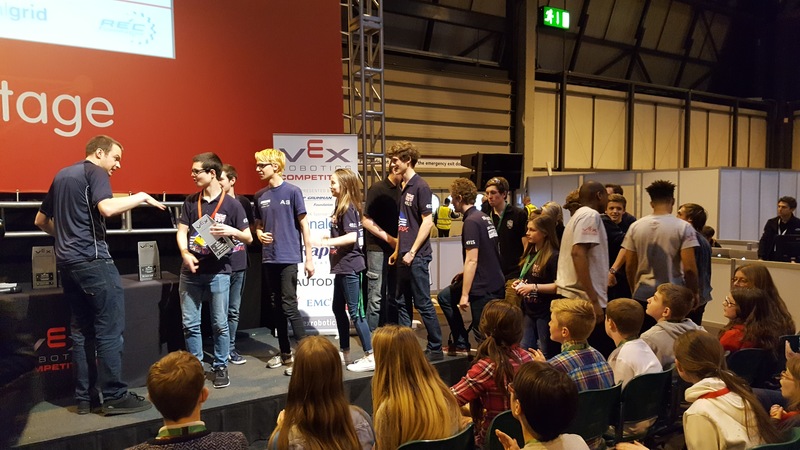 The final would be one of the most exciting, closely fought and controversial finals in the history of UK VEX. Round 2 was very controversial as the Red alliance drove into the Blue alliance robot in the “protected” zone and managed to disable one of the Blue alliance robots. This was unseen by the judges and had a big effect on the score which ended 181 to 90 in favour of the red alliance. A protest ensued after the buzzer but was turned away by the judges leaving the match tied at 1-1. Round 3 was another frantic match with both teams seeming to score freely until midway through when the blue alliance was once again infringed by the red alliance. this time the judges were on hand and issued an immediate warning only to incredulously see the red alliance repeat the offence! The match ended and the nervous wait began to see who had won the final deciding round. 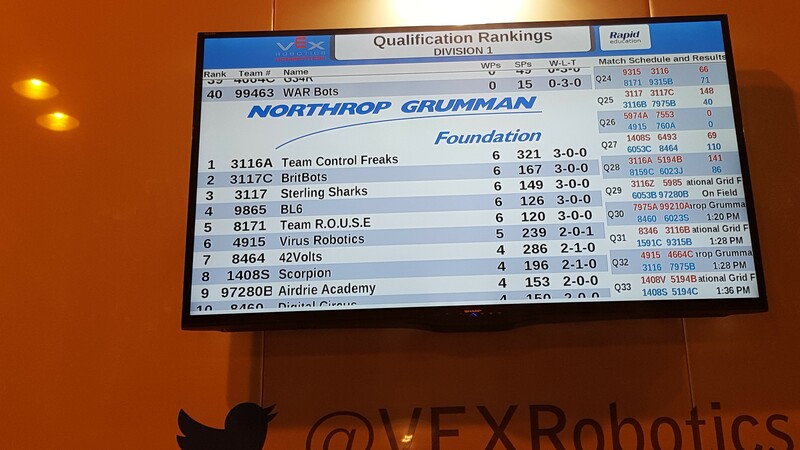 After what seemed like an eternity, the results were displayed and the blues had scored 215 points to the red alliance 0. 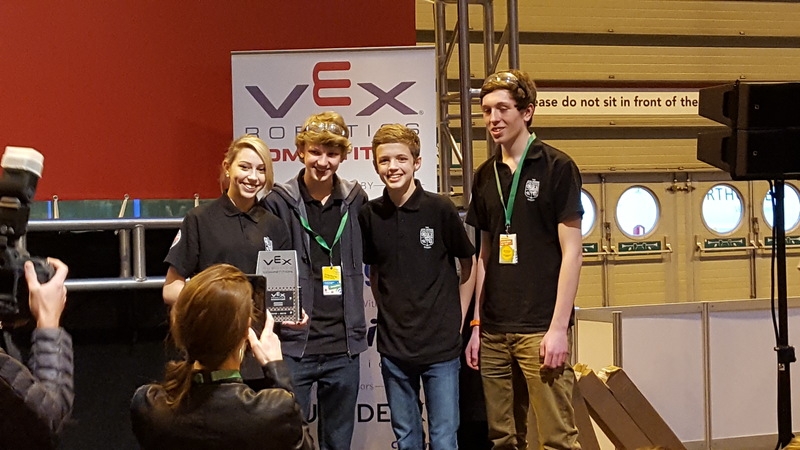 The red alliance had been disqualified for their repeat infringement and the National trophy was going to the three team alliance of Virus, Smooth Ops and The Control Freaks team from John Warner consisting of Georgia D’Ath, James Cosgrove, Carl white and driver Chandler Walker. 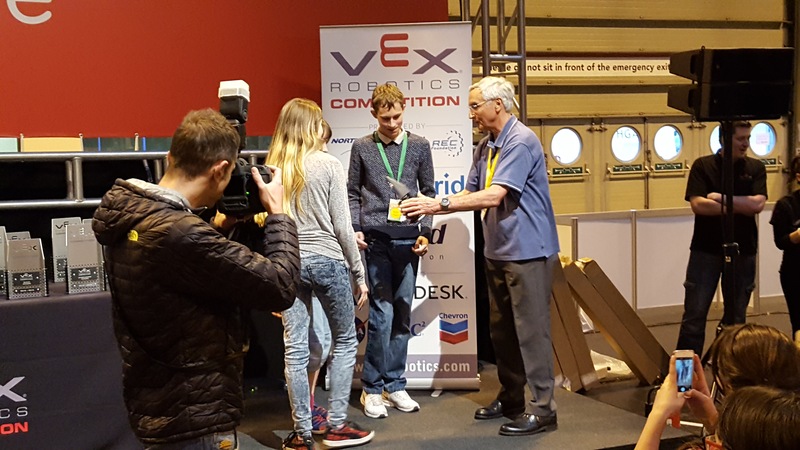 To make the comeback even sweeter, at the awards ceremony team 3116B also picked up the Design award for their portfolio of work and technical design which had been compiled by Georgia from the designs of Carl and James. 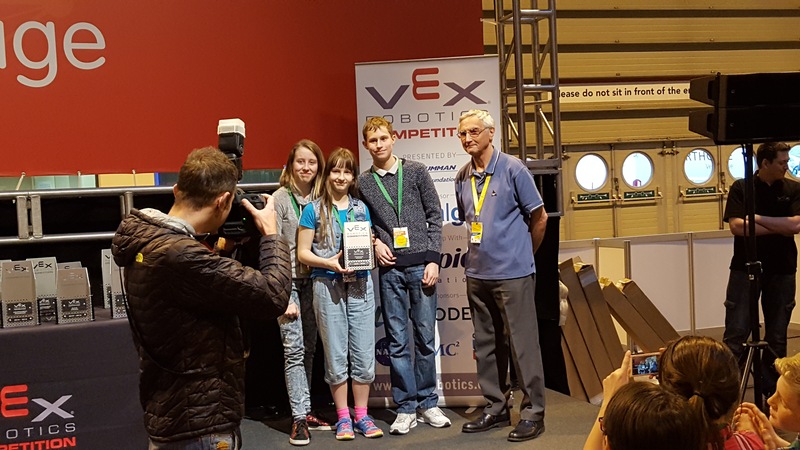 So at the end of three fun filled, exciting days of robotics competition, The John warner School robotics team came away as National champions once again, Innovation award winners and Design award winners. Worthy prizes for the hard work and effort the teams have all put in over the course of this season, well done to all of you!